With his brilliant restart to the Star Trek series in 2009, director JJ Abrams delivered an origin story that was both respectful to the series’ history while unafraid to take its well-known characters in new and surprising directions. Added to this, its tone was lighter and funnier than the average post-Dark Knight blockbuster; it felt fresh, and more importantly, accessible to all audiences, regardless of prior Trek knowledge. This sequel, directed again by Abrams, sits firmly in the ‘more of the same’ camp: it’s funny, dramatic and very exciting, but for the most part it lacks that freshness. Abrams is still boldly going, it’s just that this time he has already been there once before. As in the first film, Chris Pine and Zachary Quinto are an inspired pairing as Kirk and Spock, and their squabbling bromance provides Into Darkness’s breathlessly-paced adventure with a heart. The story involves Kirk leading the Enterprise crew in pursuit of ex-Starfleet commander John Harrison (a thrillingly cold Benedict Cumberbatch) who disappears into Klingon territory after carrying out a devastating attack on Starfleet. In the midst of the spectacular action that ensues there isn’t a great deal of room for characters to make an impact, but Simon Pegg makes the most of some crucial moments as Scotty, and Karl Urban is excellent as the eternally grumpy Bones. The writers do manage to fit in one big question, the kind of searching human inquiry that was the Star Trek TV shows’ bread-and-butter, and it’s set up by a decision Spock takes in the film’s opening moments, prompting the question of how one should approach death. Various characters answer that question, in theory and in practice, in the course of the story. This is the ‘Darkness’ of the title, and it provides a little welcome substance amidst the film’s quips and explosions. General release from Thu 9 May. 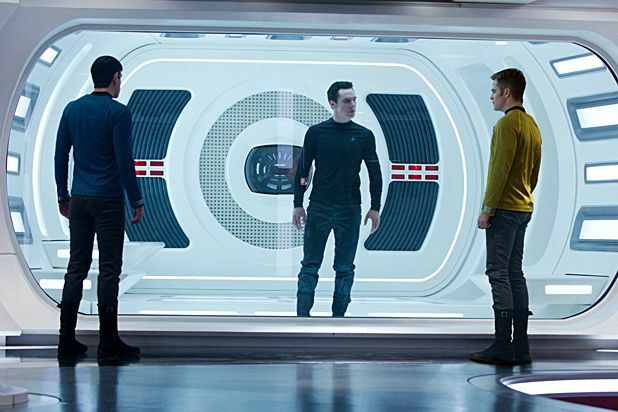 When ex-Starfleet commander John Harrison (Cumberbatch) attacks Earth, the Enterprise crew pursues him. It's more of the same: funny, dramatic and exciting, and if it's not as fresh as the 2009 film, Pine and Quinto's squabbling bromance gives it heart, Pegg and Urban are excellent and Cumberbatch is thrillingly cold.